The Sheriff's Office Marine Unit operates six different boats out of the Coast Guard stations in Grand Haven and Holland. Primary areas of patrol include Spring Lake, the Grand River, Lake Macatawa, Lake Michigan, Crockery Lake, and Cranberry Lake. The Marine Unit focuses efforts on education in an attempt to gain voluntary compliance with marine laws and safety regulations. Enforcement continues to be a component of marine safety, but education and compliance will create a safe and enjoyable boating environment. Marine Unit deputies also participate in out-of-water events, including area township fire department open houses, and Jenison, Holland, and Grand Haven area parades. Deputies team with the Lakeshore Safe Kids Coalition in distributing water safety information throughout the lakeshore area. Deputies and volunteers distributed over 200 children's personal floatation devices (PFDs - life jackets.) The PFDs were raffled off and distributed to boaters during safety inspections. Where PFDs were found to be inadequate, missing or have the wrong type or size, a new PFD was given to the child. New for the Marine Unit was the Beach Survival Challenge, which focused on beach and pier safety at the Grand Haven State Park. 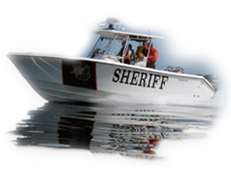 The Sheriff's Office Marine Unit consists of one full-time sergeant and thirty-nine seasonal, part-time deputies. Sgt. Eric Westveer currently oversees the Marine Unit. Sgt. Eric Westveer is available for questions or comments regarding the Marine Unit.